It's a concept you don't want to wrap your head around, we know. A lesson you don't care to learn. Succumbing not merely to their victimization, but to their continual victimization-in-increments, the pigs are thoroughly invested in this process. "Good pigs like us," they croon, "you don't eat all at once!" So they stand up there strumming and plucking—and rushing back to tend the fires beneath their severed limbs—to sing the praises of their dismembered and barbecued body parts. Never let it be said that the suicidefoodists are without their fine qualities: they have iron stomachs. Drink in the horror. (A great advertising slogan for this place!) 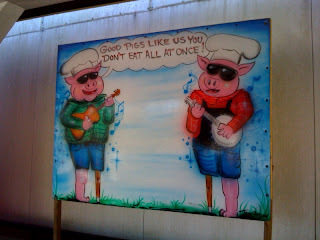 The two pigs are whittled away main course by main course until all that's left of them is an idea. And that lonely idea reverberates around the restaurant like a ghost, summoning up honorable appetites from the ashes. Addendum: It hardly seems possible, but this is our fourth example of pig amputees. I'm a Hog for Que, Baby!